This week, Xyron teamed up with Paper Smooches. We were able to choose our stamp sets and dies, and I LOVE the one I picked. I got a matching set of Talk Bubbles stamps, and the Speech Bubbles dies. 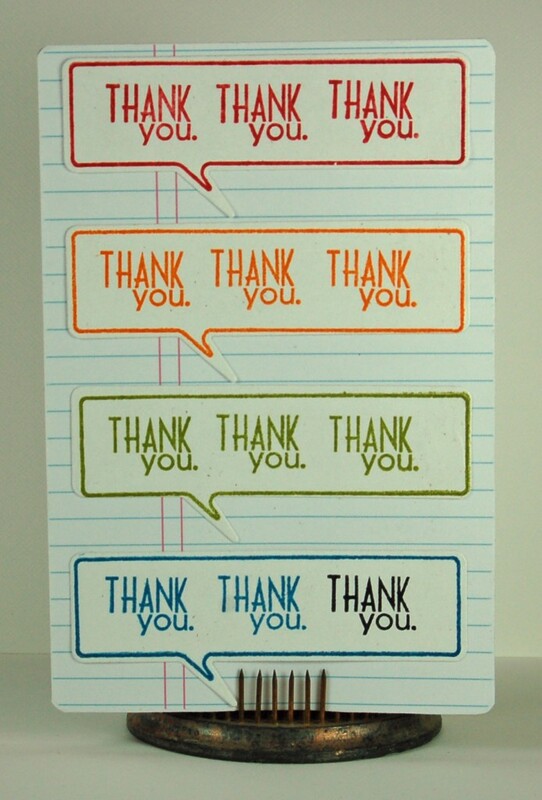 I am sure that you’ve heard me say this a lot, but I make a lot of thank you notes and also a lot of birthday cards. Those two are what I use the very most of. Those are the sentiments included with this set, so it is perfect for me. How about now we look at what I made with my stuff? 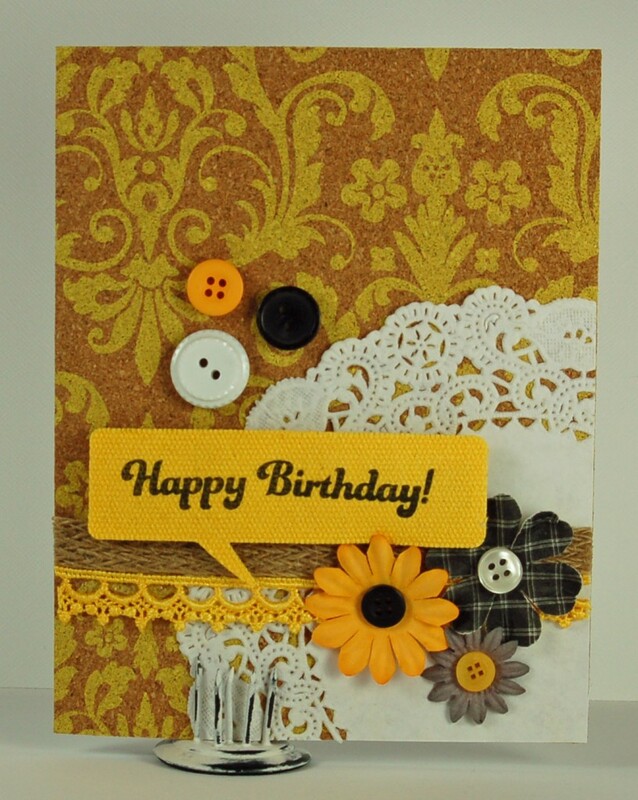 I combined some cork paper, a doily, flowers, buttons and trims with my stamped sentiment and die-cut shape for this girly birthday card. The die was cut out of a canvas fabric and I stamped the sentiment on there with Staz-On ink in black. I stuck with that black, white, grey and yellow color combo when I started adding my embellishments. I used my Xyron Mega Runner to attach the doily so that it wasn’t laying completely flat on the card, and used High Tack tape for the burlap ribbon. 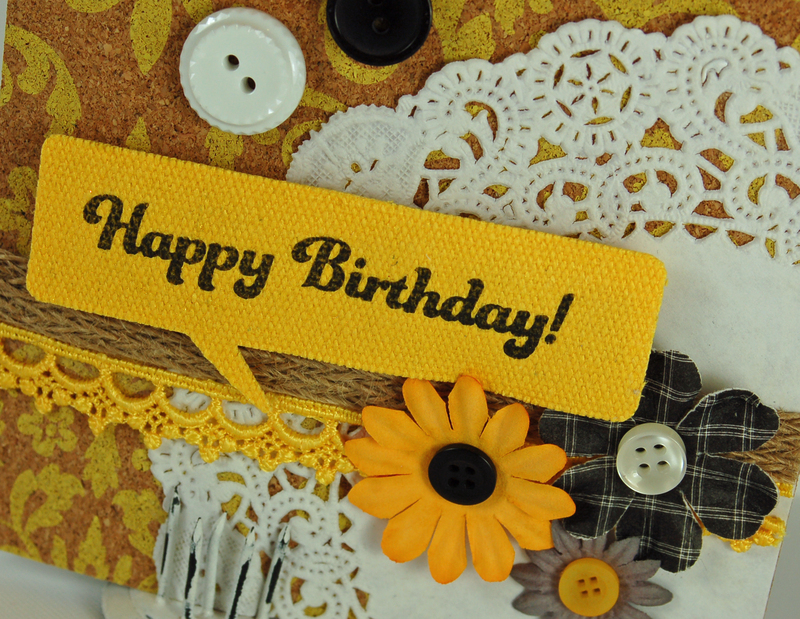 I ran my lace through the Xyron 1.5″ Create-a Sticker, attached the sentiments with foam adhesive from the Teresa Collins adhesive kit, and everything else went on with High Tack dots. I love all those little details, and they are going nowhere! For this card, I went with a clean look. It’s really all about the sentiment/stamps. I used a lined scrapbook paper for a school look on this card. If you have kids, you might be worrying about end of the year gifts for teachers, and I thought that it would be nice to have some thank you cards made up that I could either write in myself or have my kids write in to thank their teachers for a great year. Quick and easy never hurts either! I used my Xyron 510 Creative Station to attach my background paper, and the die-cuts went on with my Mega Runner. For these little cards, I wanted to make another set that could be used for a quick thank you (I actually know that some of the teachers at the school keep a set of these on hand when they need to send a quick something home with a child that brought a gift to school). I used this adorable Die Cuts With a View stack called Chalk Art. I love the chalkboard-style finish of this paper and the colors are really bright and fun. I played those colors up with some Bazzill cardstock and colored inks. I also thought that the punch with the torn edge gave it more of a school style. I might make a few more quick sets of these to give as gifts. 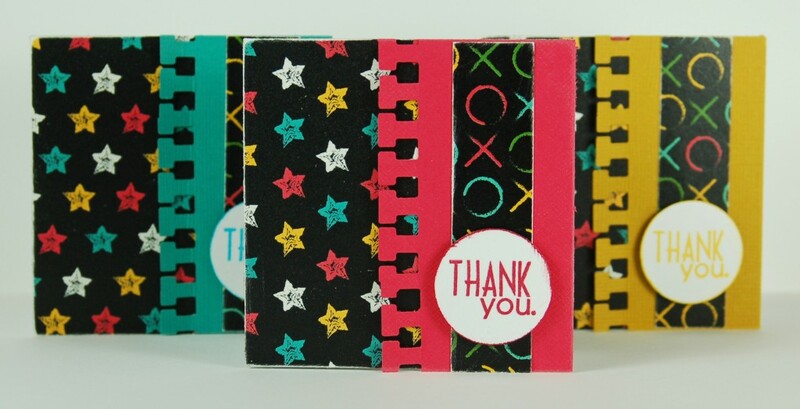 To make these, I attached the background paper with my Xyron 510/Creative Station, then added the punched strip and patterned paper strip with my Xyron Mega Runner. I made myself some foam adhesive with my Creatopia and used that to attach the sentiments. Be sure to check things out over at the Paper Smooches web site, there are more amazing project ideas there! You’ll also want to check out the Xyron Facebook Page, there is always something happening over there! I’ll be back soon with more projects! I have some fun things planned and I can’t wait to get back to crafting! See you soon! Previous postXyron + Miss Kate’s Cuttables = Cute! Next postI got scrappy with Xyron and DCWV! Very cute creations, Love all of them. Love your cards! The last with the notebook looking piece is so cute and fresh looking. 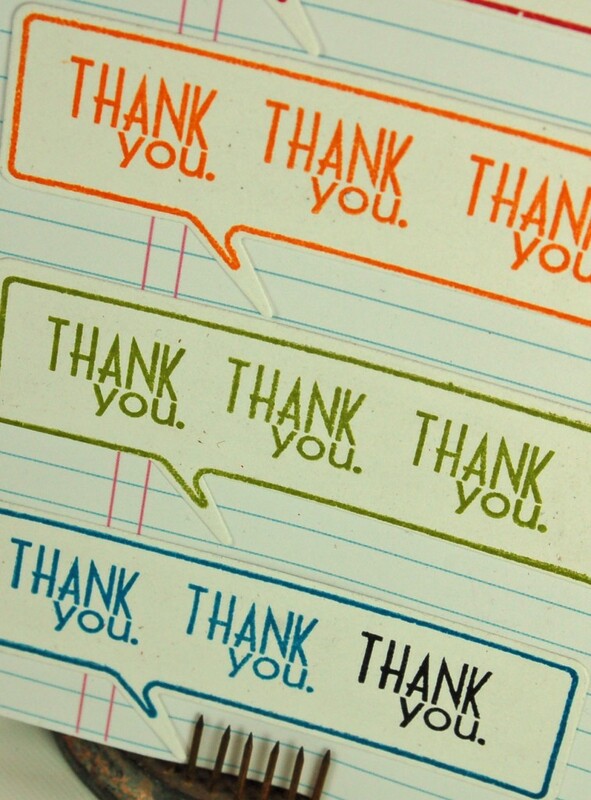 Love all the thank you quote bubbles too.